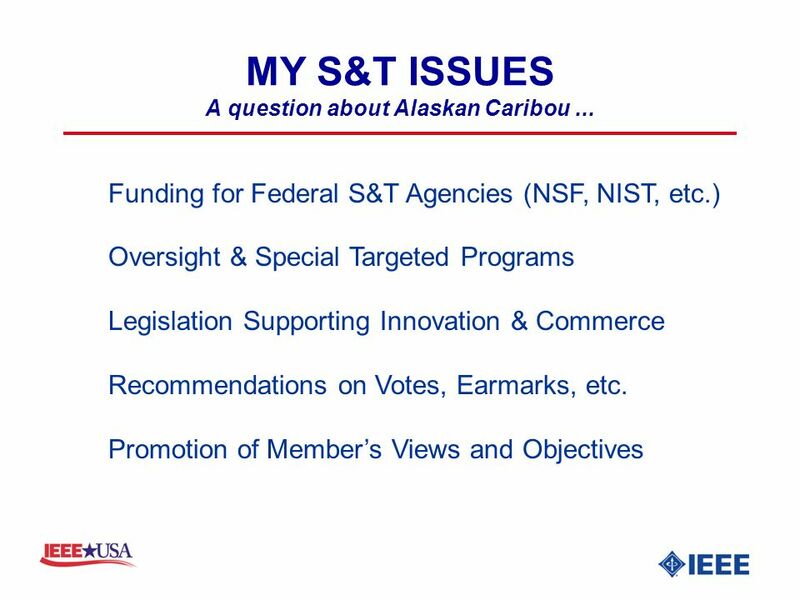 3 OVERVIEW S&T Public Policy: What Are The Issues? 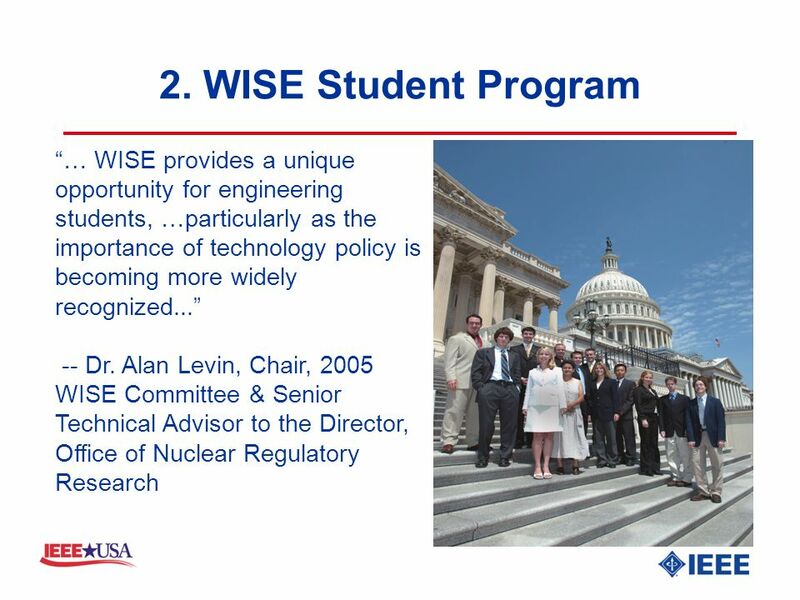 Why Should You Be Involved? 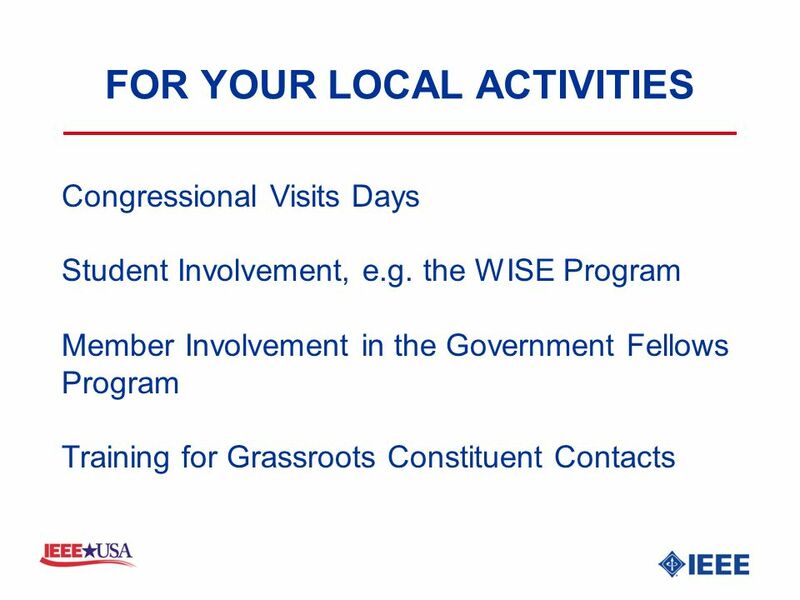 How Can You Be Involved? 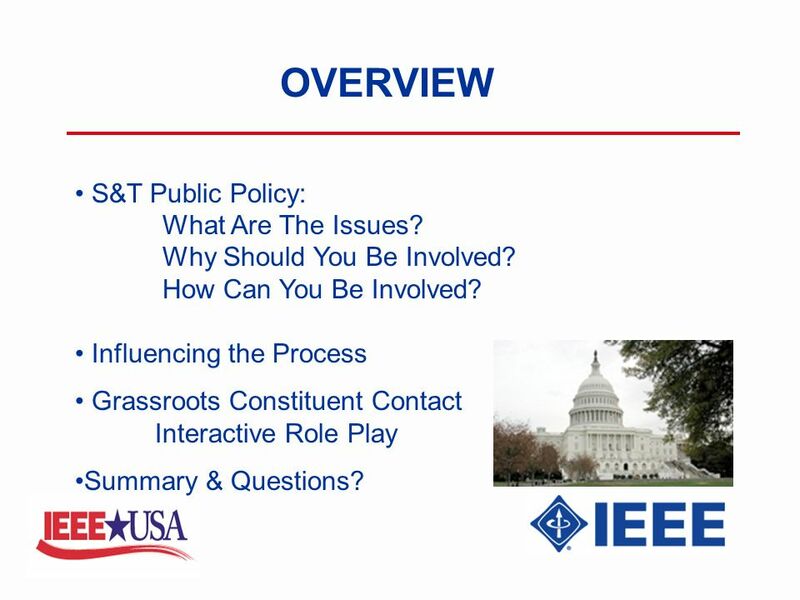 Influencing the Process Grassroots Constituent Contact Interactive Role Play Summary & Questions? 10 1. 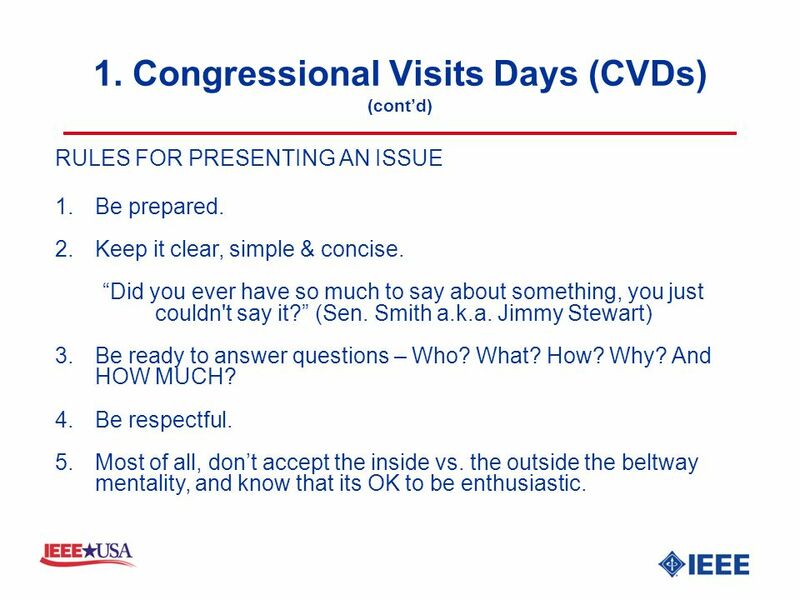 Congressional Visits Days (CVDs) (contd) RULES FOR PRESENTING AN ISSUE 1.Be prepared. 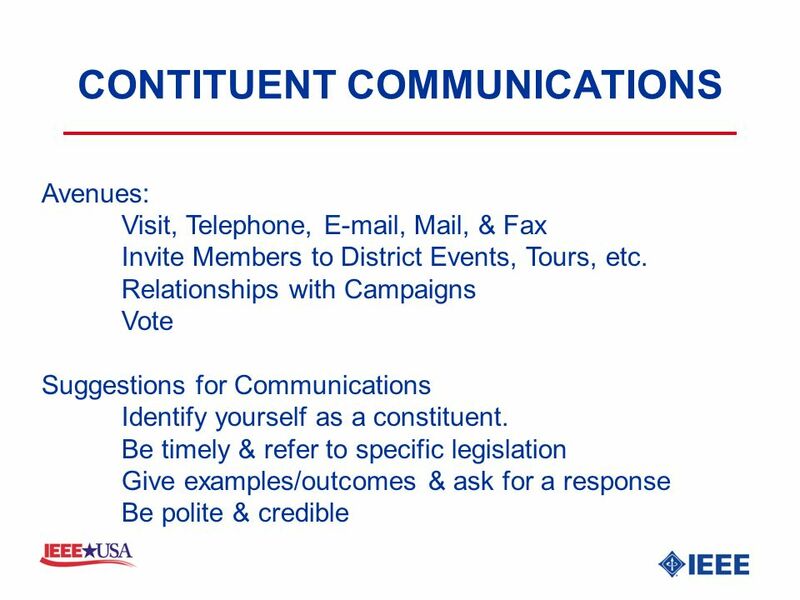 2.Keep it clear, simple & concise. Did you ever have so much to say about something, you just couldn't say it? 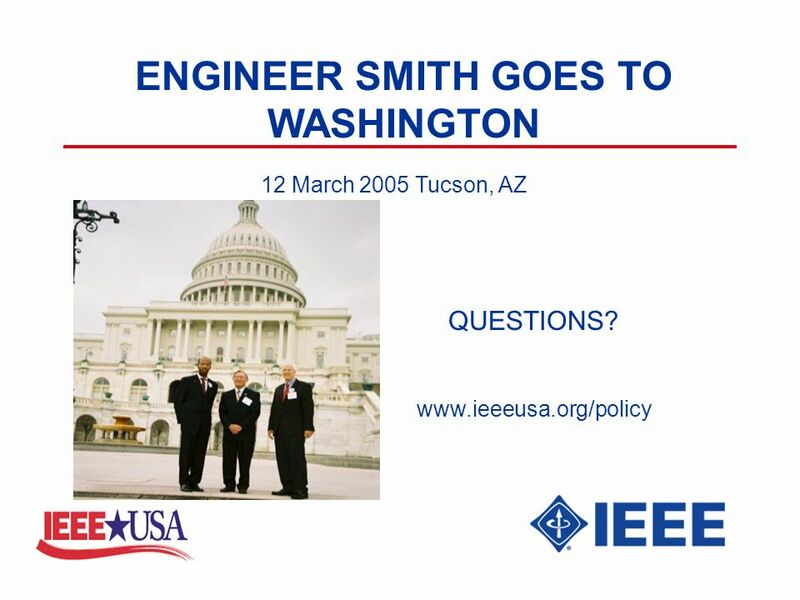 (Sen. Smith a.k.a. Jimmy Stewart) 3.Be ready to answer questions – Who? What? How? Why? And HOW MUCH? 4.Be respectful. 5.Most of all, dont accept the inside vs. the outside the beltway mentality, and know that its OK to be enthusiastic. 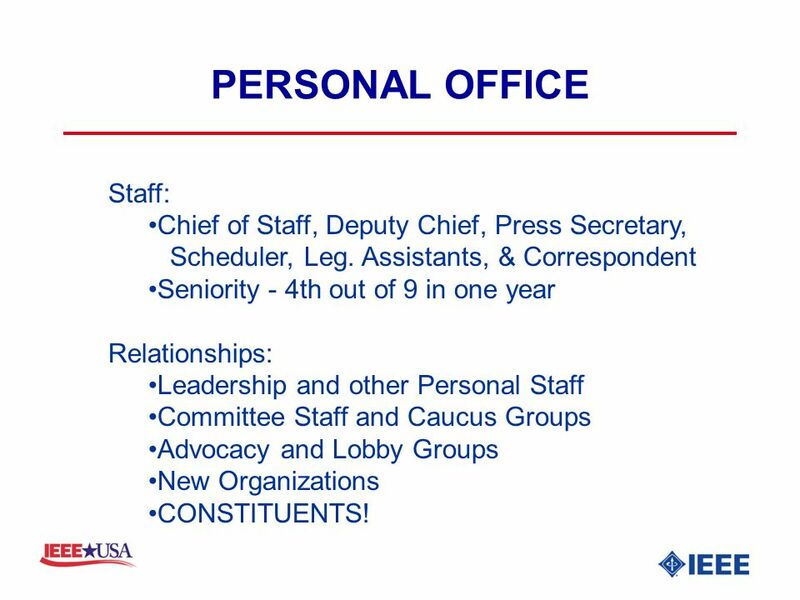 17 PERSONAL OFFICE Staff: Chief of Staff, Deputy Chief, Press Secretary, Scheduler, Leg. 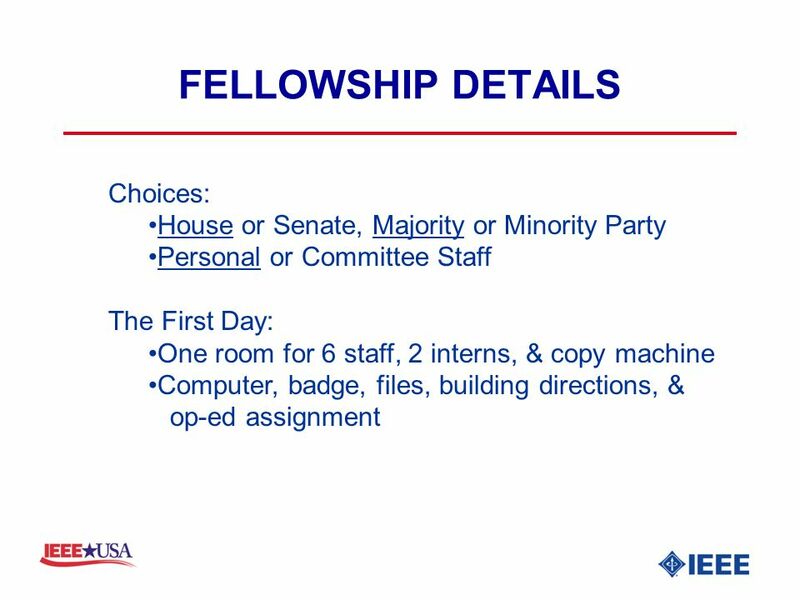 Assistants, & Correspondent Seniority - 4th out of 9 in one year Relationships: Leadership and other Personal Staff Committee Staff and Caucus Groups Advocacy and Lobby Groups New Organizations CONSTITUENTS! 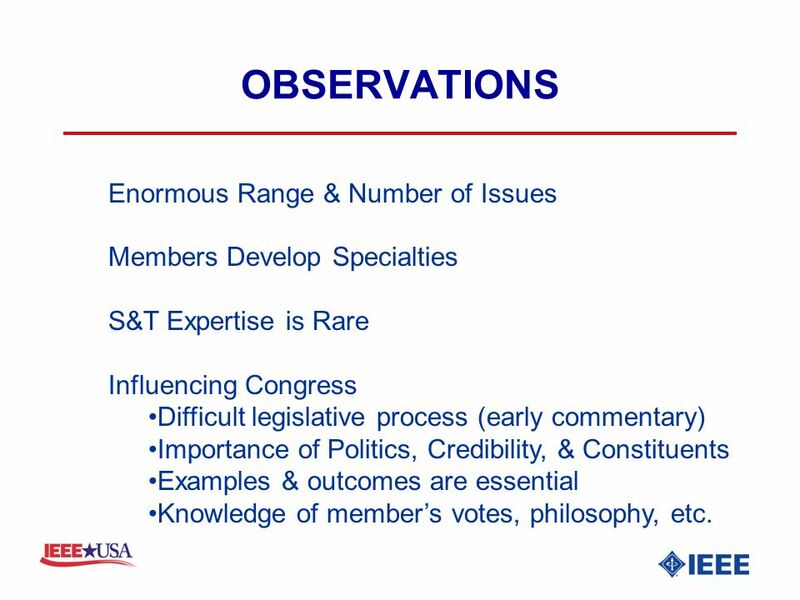 20 OBSERVATIONS Enormous Range & Number of Issues Members Develop Specialties S&T Expertise is Rare Influencing Congress Difficult legislative process (early commentary) Importance of Politics, Credibility, & Constituents Examples & outcomes are essential Knowledge of members votes, philosophy, etc. 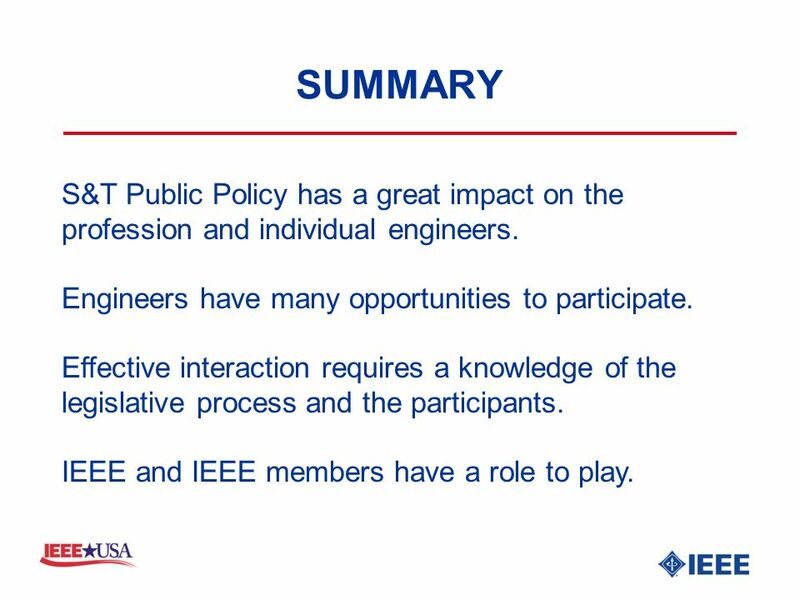 25 SUMMARY S&T Public Policy has a great impact on the profession and individual engineers. 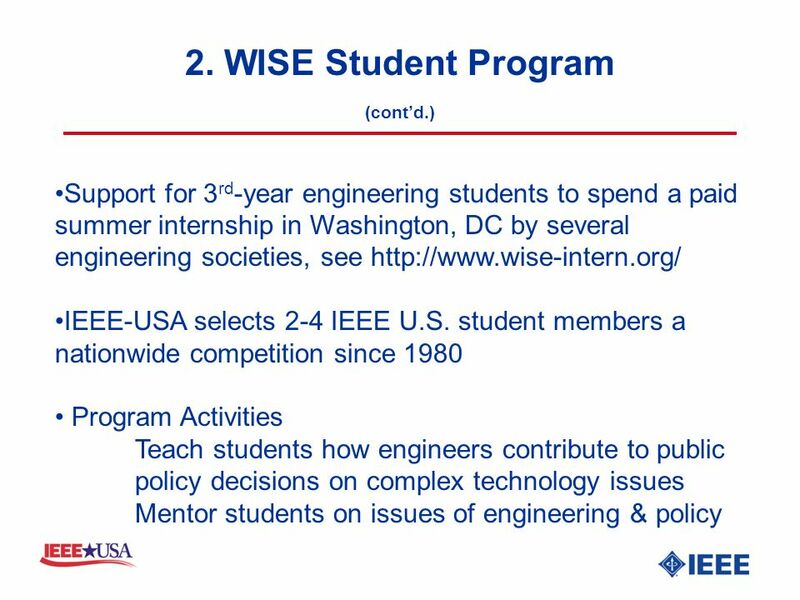 Engineers have many opportunities to participate. 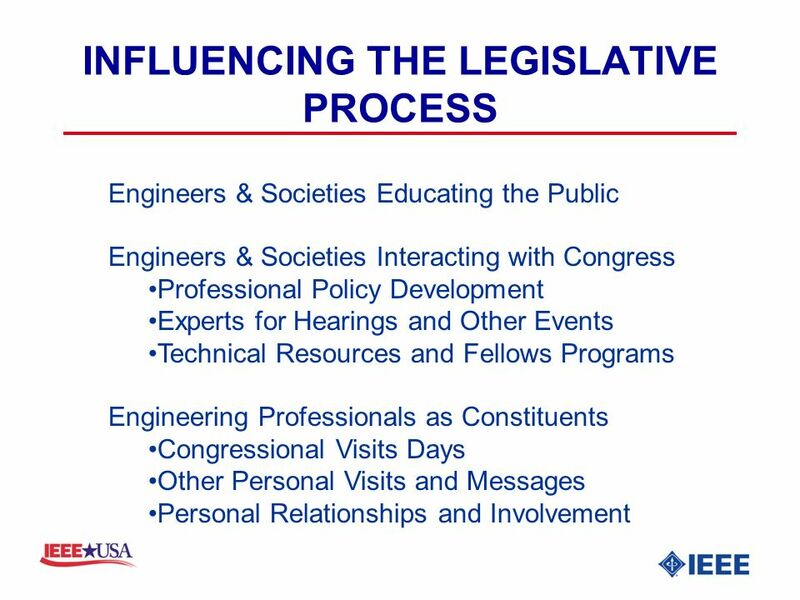 Effective interaction requires a knowledge of the legislative process and the participants. 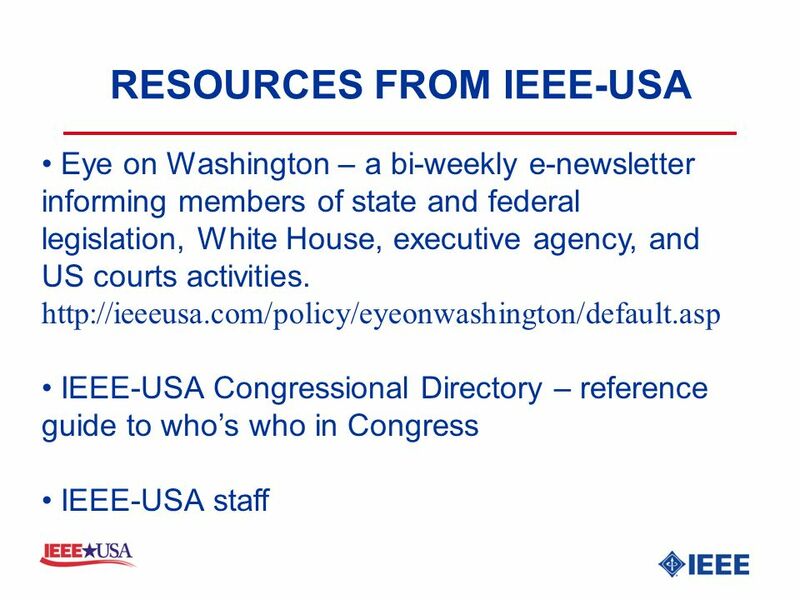 IEEE and IEEE members have a role to play. 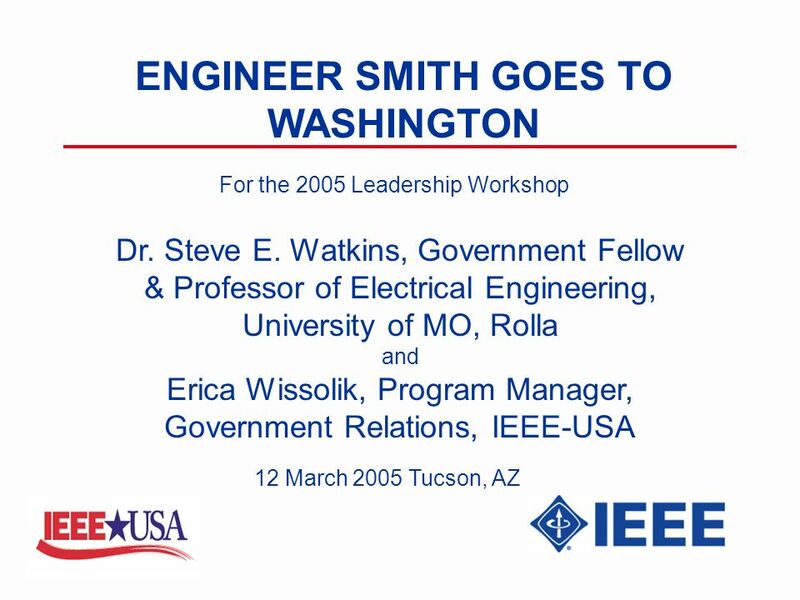 Download ppt "ENGINEER SMITH GOES TO WASHINGTON Dr. Steve E. Watkins, Government Fellow & Professor of Electrical Engineering, University of MO, Rolla and Erica Wissolik,"
Playing to Our Strengths Engaging the Political System on the Local Level Russell Harrison IEEE-USA. 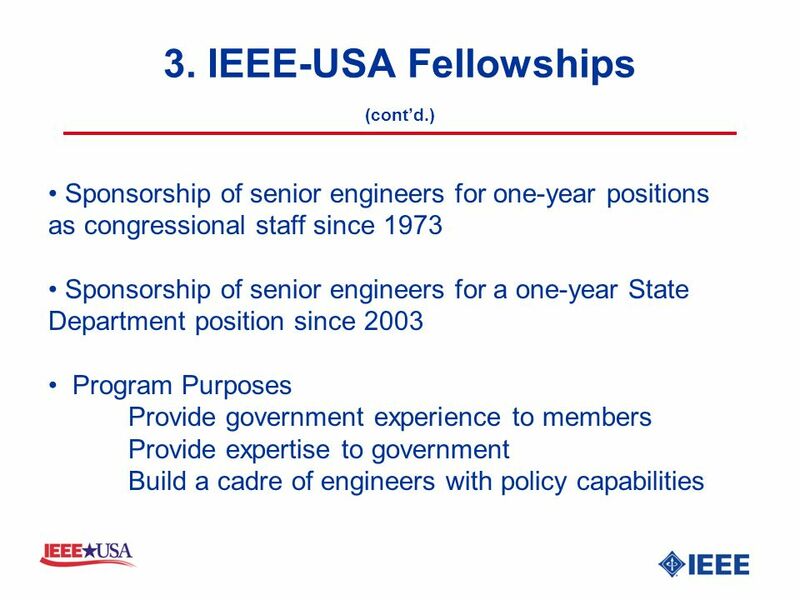 GOVERNMENT FELLOWSHIPS & WISE Linking Engineers With Government. 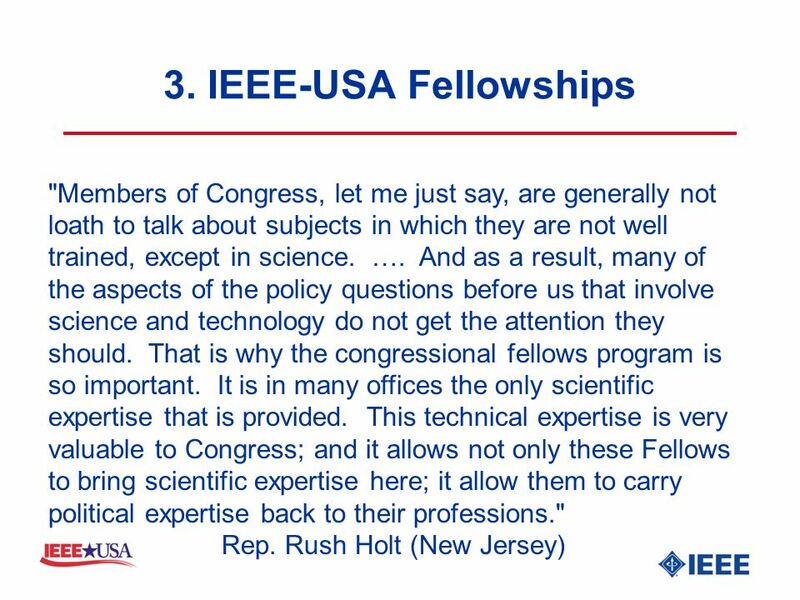 Playing to Our Strengths Grassroots: Using the IEEE Membership to Motivate Legislators Russell Harrison IEEE-USA. 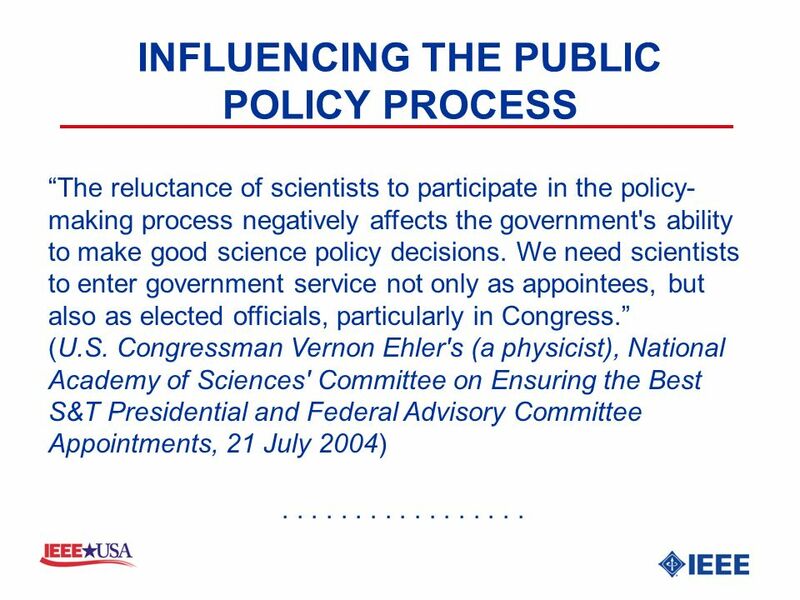 Chapter Eleven The Citizen in Government The Political System ~~~~~ Interest Groups. 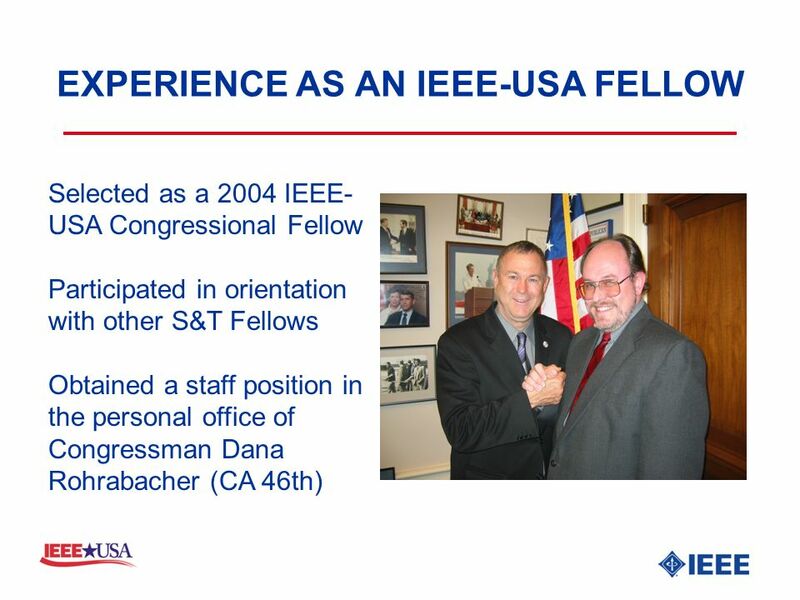 The Institute of Navigation GOVERNMENT FELLOWS PROGRAM OVERVIEW. 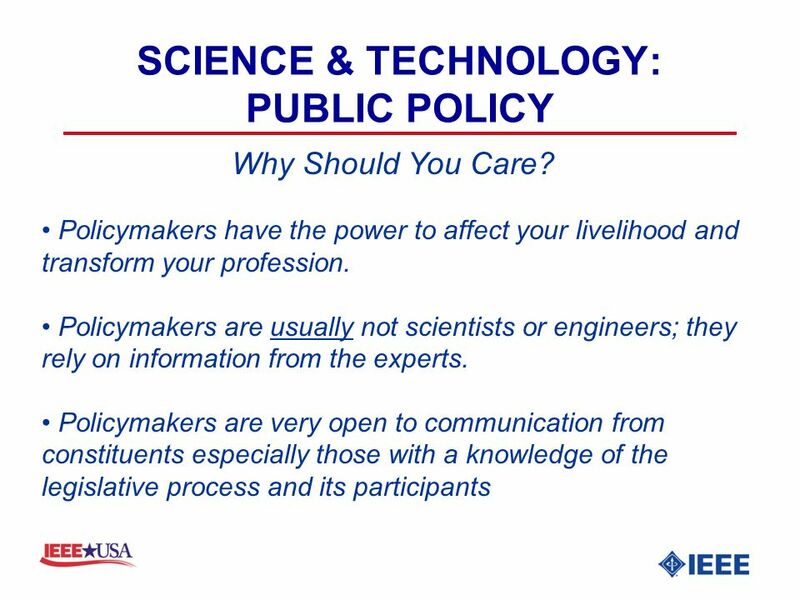 Lecture 5 Communicating with Policymakers Andy Schneider, J.D. 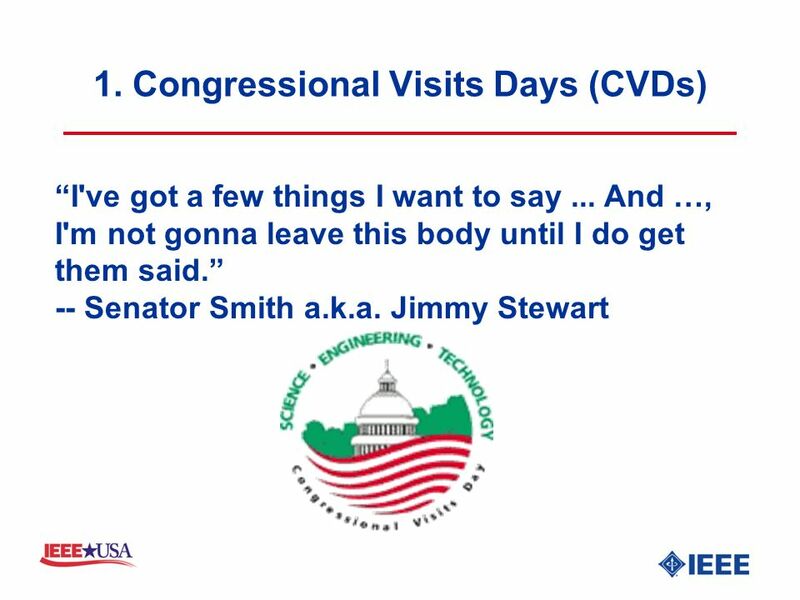 Former Chief Health Counsel House Committee on Energy and Commerce. 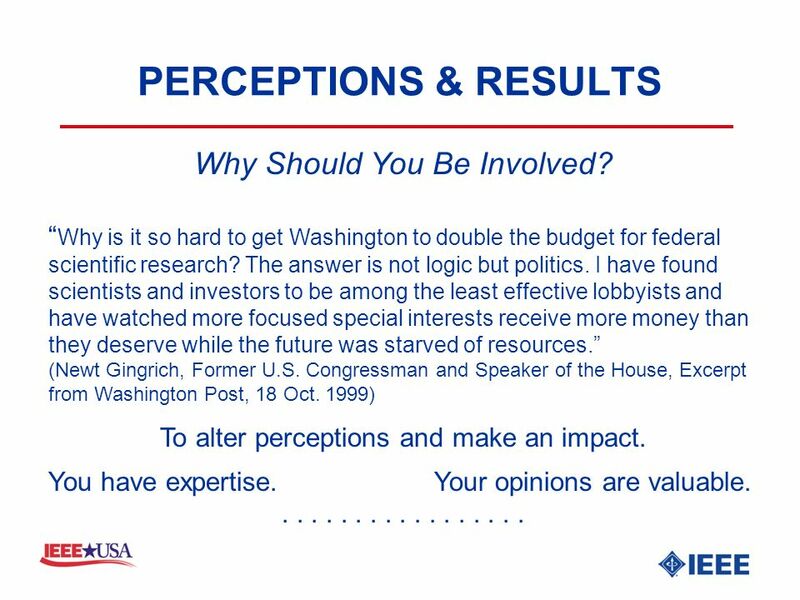 Congressional Committees. Standing committees Select committees Joint Committees Conference Committees. 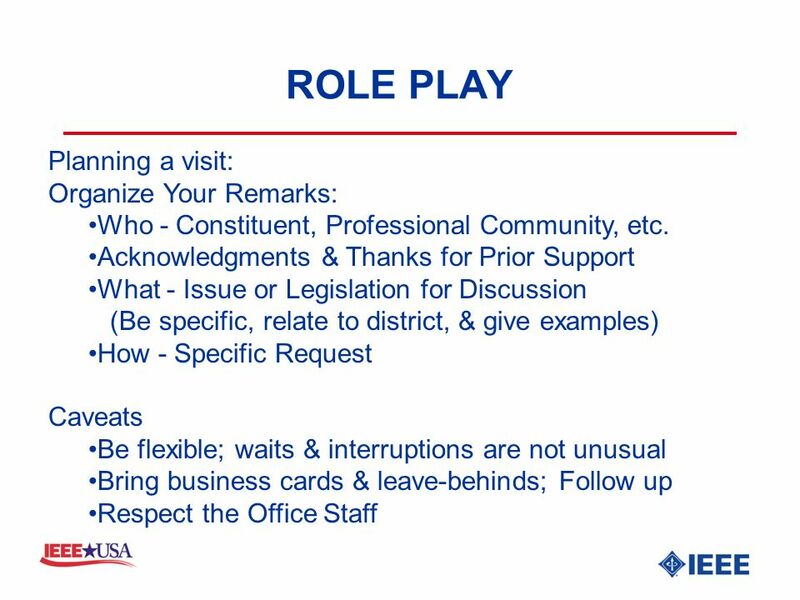 Lobbying How to lobby your legislator with … Bill Hanlon. 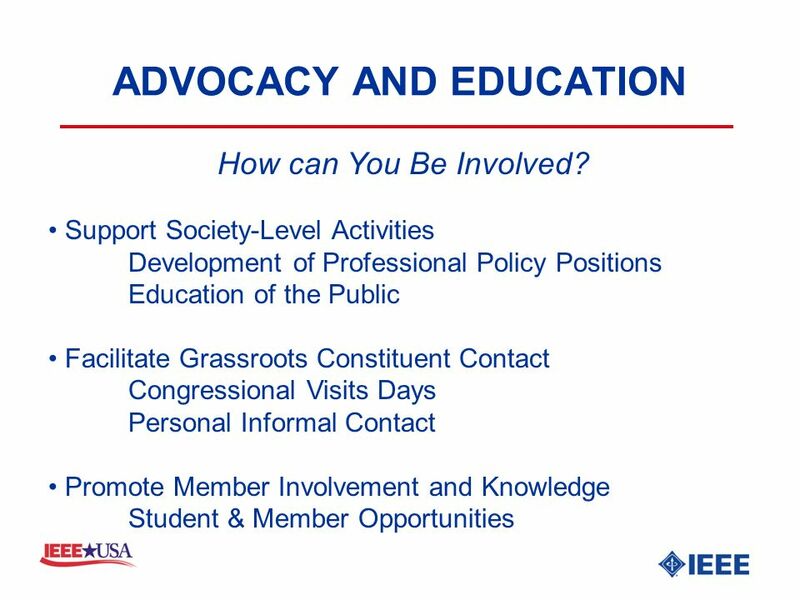 Lobbying for Quality Patient Care Presented by: New York State Nurses Association Practice and Governmental Affairs Program. 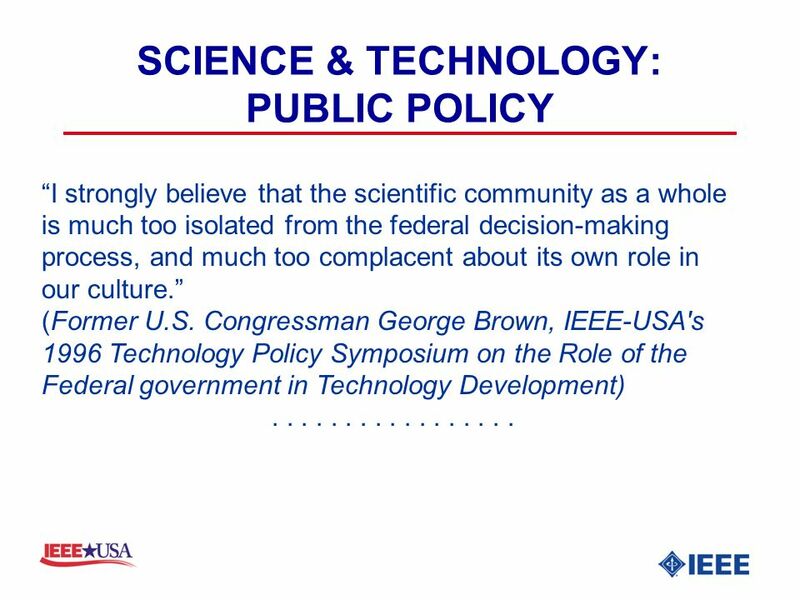 Robert Gropp, Ph.D. Director of Public Policy Richard O’Grady, Ph.D. Executive Director. 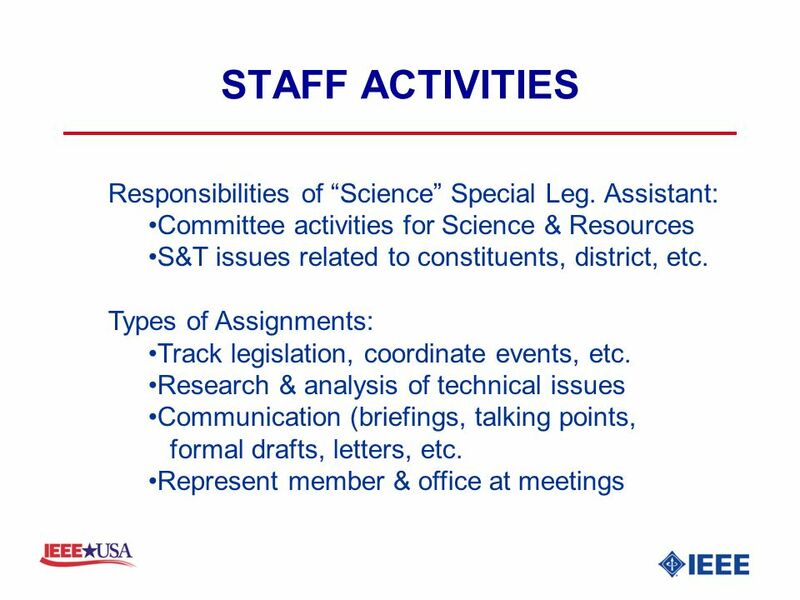 Congressional Committees and Staff. 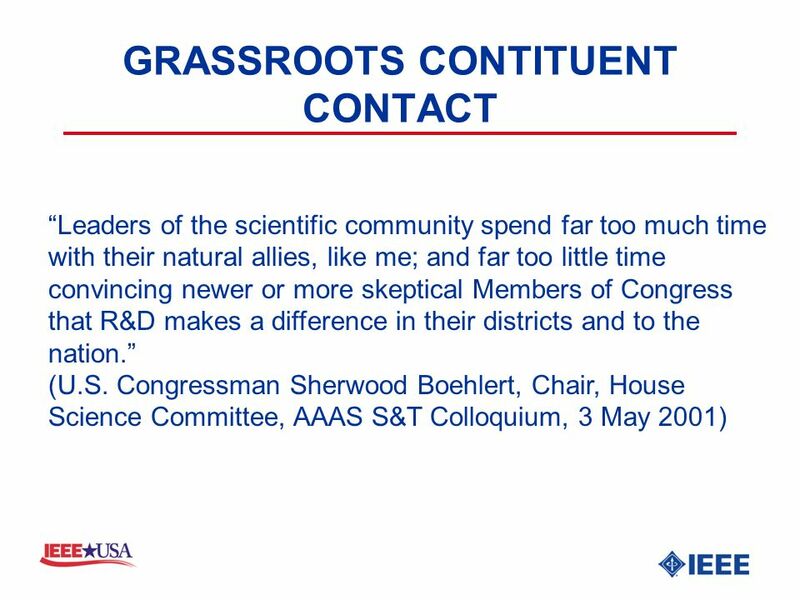 Purposes of Committees Committees ease Congressional workload by dividing work among smaller groups, allowing members. Advocacy Strategies for New CAN Coordinators How to Grow A Successful Grassroots Network CEC CAN Summer Policy Series July 2013. 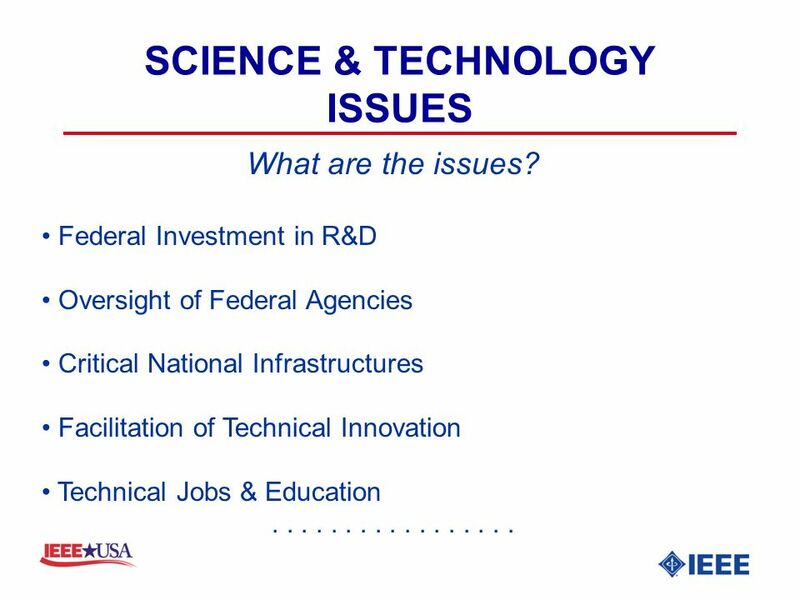 Congress Chapter 12. The Representatives and Senators The Job Salary of $174,000with retirement benefits Office space in D.C. and at home and staff to.